Burned out veteran Eddie Dugan (Golden Globe®-winner Richard Gere) is just one week away from his pension and a fishing cabin in Connecticut. Narcotics officer Sal Procida (Oscar® nominee Ethan Hawke) has discovered there’s no line he won’t cross to provide a better life for his long-suffering wife and seven children. And Clarence “Tango” Butler (Oscar® nominee Don Cheadle) has been undercover so long his loyalties have started to shift from his fellow police officers to his prison buddy Caz (Wesley Snipes), one of Brooklyn’s most infamous drug dealers. With personal and work pressures bearing down on them, each man faces daily tests of judgment and honor in one of the world’s most difficult jobs. When NYPD’s Operation Clean Up targets the notoriously drug-ridden BK housing project, all three officers find themselves swept away by the violence and corruption of Brooklyn’s gritty 65th Precinct and its most treacherous criminals. During seven fateful days, Eddie, Sal and Tango find themselves hurtling inextricably toward the same fatal crime scene and a shattering collision with destiny. 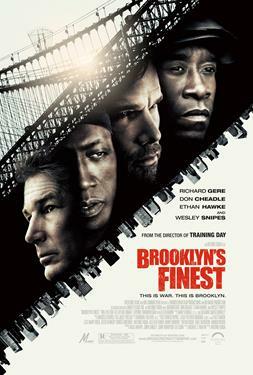 The film captures the volatile and deadly world of one of New York’s most dangerous precincts through the eyes of the men and women pledged to protect and serve, as they face the wrenching choices that make them Brooklyn’s Finest.